Since around 1985 I’ve been playing drums or guitar in one band or another. Whether it was my humble beginnings with Dangerous Games at the tender age of 16 or the fun I've had more recently with DRESSED TO KILL (of which more later) I’m just another one of those blokes who can’t shake the thrill – the ‘drug’ if you will – of performing music live. My desire to be a rock star playing my own songs took in the aforementioned Dangerous Games (my 6th form college band) and then onto 6 years in Brummie sleaze rockers Shotgun Wedding, where we tried to ride the Guns n Roses wave of LA metal acts with a British slant gaining moderate success (well, Kerrang! magazine liked us anyway) before splitting in 1994. Then came my closest brush with rock n roll infamy as drummer with Sons Of God, a Cardiff-based glam rock act with enormous talent and great songs who were signed to independent label MGL Records in 1995, only to be frustrated in our attempts to get an album released before the band unfortunately splintered in 1997. After that disheartening experience, I ended up joining some of my ex-Shotgun Wedding bandmates who’d formed a Bon Jovi tribute called New Jersey and I spent the next few years playing drums for them as they garnered a glowing reputation as an unerringly accurate version of Jon Bon Jovi’s boys. I also joined two of my good friends Phil Docker & Nigel Joiner on occasion to play rock covers in The Three Amoebas, a band of no fixed ability, but with a good sense of humour, and our versions of Motorhead, Macc Lads and AC/DC songs have become something of legend in Birmingham & Solihull over the last decade or so! My other sometime rock covers band was Americana, which I formed with New Jersey & Dangerous Games members from down the years and I’ve had some great times with them too. I have also covered on drums and guitar duties regularly over the last decade for Dizzy Lizzy (guess who they do a tribute to?) as well as appearances for Toxic Twins (Aerosmith) Foreigner 4 (Foreigner, naturally) Keep The Faith (another Jovi tribute) Being Paul Stanley (with Dressed To Kill & Three Amoebas pals) and I once even got the chance to play drums for the legendary Steve Gibbons Band – a true honour! Along with that came the chance from 1997 to 2008 to play in the truly fabulous tribute Ian The Goat Sings Black Sabbath, a wickedly funny mixture of tribute band and pantomime featuring the quite brilliant Ian “The Goat” Kay as Ozzy Osbourne and the late great Stu Clarke as guitarist Tony Iommi with an act that was always fun and often side-splittingly funny wherever we played. All fun days, and all hugely enriching in their own way. I have many many treasured memories of transit vans, dodgy promoters, fleapit venues and eccentric band members to reflect on. Who knows – maybe I’ll write a book on it one day if anyone’s genuinely interested!!!!!!!!!!! 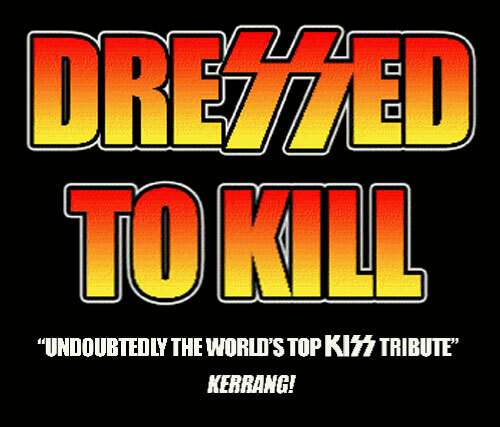 I’m proud to say that, as a KISS fan of some 30 years standing, it was an absolute honour and privilege to be asked to join DRESSED TO KILL as drummer back in 2005 and I spent 5 incredible years touring with them across the UK and Europe. I came up with the idea of an arrangement of “Rockin’ Around The Christmas Tree” that incorporated KISS’ huge hit “Rock and Roll All Nite” which the other guys loved as a great match of tunes, and so we recorded that along with a faithful rendition of the KISS KLASSIC “Got To Choose”. Enjoy. I certainly did for 5 glorious years.